oh my god. this is going to be harder than i thought. that said, everything is still consistent with my hunch on sabrar's role. I saw one kill target. Assuming my logic isn't faulty, I think that cannot be exactly one. What I mean to say is - that claim causes a contradiction which would imply either you or Madge are lying. @Carlington: is this conclusion dependent on your private info? Because otherwise I don't see the contradiction as there are simply too many variations. I just realized a lot of my analysis yesterday was wrong. Ok let's start putting in some information. Everyone should reveal something they know. And then we'll see where there is a disconnect. My passed card (from Sabrar) was the Assassin card. Therefore FMPOV the assassin is more likely to be Sabrar than anyone else. 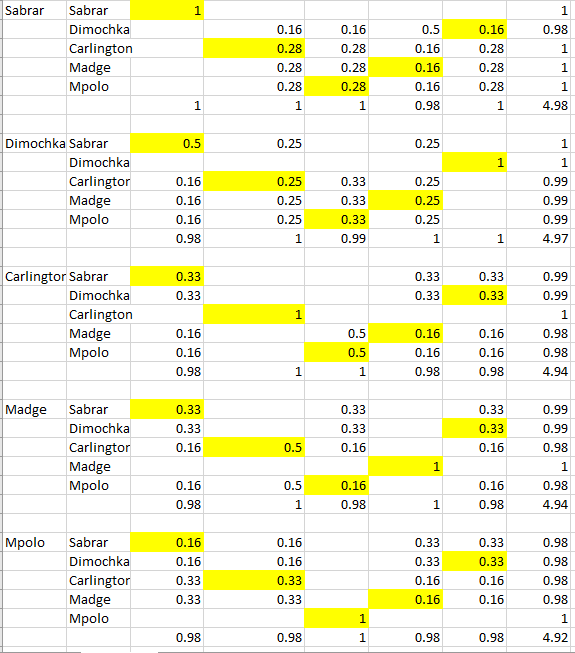 But this is purely based on probabilities, since mpolo could've gotten it and had it passed to Madge/Carlington. The main point of this claim is to state that I am NOT the bystander. Just to confirm, I passed the Assassin to dimochka. At this point mpolo must have seen the VIP card at some point (unless you want to admit of being the Assasssin? ). Though I would advise you not to reveal which of the cards it was. I'm seriously lost as to where to go with this without outright claiming or asking for claims. Anyone have some ideas? Or questions that could help? Bystander simply does not want to be shot (and nobody wants to shoot her either). Probably should claim, but probably everyone else should claim bystander too, so doesn't really tell you anything. As it stands Sabrar is clearly lying, carlington is probably lying (or both telling the truth for WIFOM). Mpolo - are you really the bystander? Does anyone want to counterclaim? OK I'm making a truth table and re-reading the thread. I think I have my head around it. Now I understand what's going on I think my previous post is a bit elementary, but it was part of my process OK?? Carlington wrote: Exactly one of the cards Madge saw ended up with either Sabrar or dimochka. Is this a claim or observation? You and mpolo could each have my cards. (Reads exchange with Sabrar). Okay, so you're saying you got back one of your two starting cards. I think I can narrow down Carlington's role. Carlington either has the role he passed me, or is a Bystander. Is this correct? Agh, hang on. I have to take another look at my working now, I neglected that Madge passed her card to mpolo before any shuffling took place. So you're saying you didn't pick up the role you passed me? No, that part is accurate and doesn't rely on any logic. The rest relies on logic that might be false. It would help me to know whether you saw any kill targets, Madge. Should I want to help you, though? You should already know the answer to that. Assuming other people are telling the truth in their claims, I STRONGLY believe that neither the red team nor the blue team benefits from killing Carlington (i.e. he is one of Agent / Decoy / Bystander). So here's my two cents. Bystander has no real reason to lie about their role. They could be unsure of what to do, but the play that makes the most sense is to be honest about it. Since no one except mpolo (and me, I guess) claimed bystander, I find it likely that he is indeed the bystander. And based on some information I have, I know that it is possible for him to have that card. Madge - I don't know how else to do this so I'm just gonna say it. I think we're on the same team. That is a big assumption when most players have an incentive to lie. My observation is that if everyone would shoot the person above him on the list then I will have a high chance of winning based on the possible setups. I think that's likely too. The role I strongly suspected Carlington of having was of the opposite team to mine. I didn't want Carlington to know we weren't aligned though. Yes, I really am the bystander. I'm not completely clear about how much other people saw — I saw precisely three cards, one at the original deal, one passed to me, one assigned to me at the end. mpolo wrote: I'm not completely clear about how much other people saw — I saw precisely three cards, one at the original deal, one passed to me, one assigned to me at the end. Looks like it's me/dim VS sabrar/carlington since that fits the knowledge I have. Unless you're lying scum mpolo then it's pretty clear what's happening "tonight". I hoped that we could have a bit more fun with this, but I agree that the lines are clearly drawn and we can start shooting. I've got all the information I really need. Just in case people are forgetful like me, make sure you all PM GoP with your targets, even if you're unarmed. Then we can see how this shakes out. also watch out, Carlington posted an unmarked spoiler in the main thread. I will PM the mod about how to proceed given that I've seen it. I have all your targets, but am busy for the day. The conclusion will be posted in about 9 or 10 hours. A single shot rings out across the street. The VIP drops to the floor, checking themselves, making sure it wasn't them the bullet hit. After a few seconds, the VIP stands, looking behind where they were standing a second before. Lying on the ground is a body, a perfect hole in their head. On their arm is a tattoo, branding them as a member of ARK, the terrorist organisation attempting to bring Raxxon down. The VIP breathes a sigh of relief, and gets in their vehicle, driving away. Dimochka was the Agent and fired, killing Sabrar. Sabrar was the Assassin, and failed to shoot. Madge was the VIP, and survived. mpolo was the Bystander, and survived. Carlington was the Red Decoy. The Blue team and the Bystander wins! Congratulations Dimochka, Madge, and mpolo. Oh me yarm YES. Called it! I'm trying to softclaim Agent by "asking dim for help". Hopefully Dim knows to target Sabrar though. Thanks for the game. It's amazing how much you can deduce from so little information. Good job dim on targeting the right guy! Congrats to the blue team and Survivor! You've made it very easy for me to find out who was the VIP but it was bad luck that dimochka ended up Agent and saw me passing the Assassin to him. If I ran it again, I would make everyone send me their initial claim, so that they are all revealed at the same time. Would make it a bit fairer. I think this particular setup was a bit biased towards the blue team, but not unduly so. I was surprised that Sabrar made the leap to Madge as the VIP, but I must admit, I did not pay close attention to how the claims in thread might adjust possibilities, as with knowing all the information, I'd be biased! One weakness I see with the game is that the Bystander has no reason to lie about their role. Everyone else has a potential reason to, but the Bystander is almost incentivised to reveal themselves. This could be alleviated by replacing the bystander with one of the 'advanced' roles, my favourite being the bomber (He wins, and everyone else loses if they survive), but there is also the protester and supporter roles, which put the bystander on one of the teams. As the game has not actually been released yet, I was unsure what the actual roles of the Red (and Blue) decoy says. I assumed they were just on the colour team they are assigned to, just lacking a weapon, unlike the 'decoy' role, who wins by getting shot. I can probably run another game over the weekend, if people are up for it. Or Madge can run it. I don't mind. I was actually thinking if we played again I'd claim bystander straight away because it seems advantageous to do that, and also it would eliminate a lot of the "bystandar has an easy job". But I'd probably want to change my claim so that way my partner would know who I was (unless my partner was the VIP, since the VIP doesn't need to make a decision). EDIT: just took the liberty of adding crossfire: round 2 into signups. Yeah, I wouldn't include the bomber in a 5 player game, as that puts the red team at a massive disadvantage; They need the VIP AND the bomber shot to win. The blue team just needs the bomber shot. Creates a no win situation for red team. I think a 7 or 9 player game would be the optimum number of players. You have a bystander and a decoy, and even numbers of agents and assassins. I'll put another one up in signups, see what we get. Or you can. Either way. I just couldn't help myself. got too excited.